What makes us human: love, compassion, faith? What happens when we are stripped of human contact with the people we love most, when we are encouraged to flout compassion in favor of rationality, when faith is all that is left for us and we aren’t sure we even want or can muster an ounce of pure belief? These are only a few of the questions Michel Faber addresses in his latest novel The Book of Strange New Things. A literary adventure into the speculative world of aliens, religion, and relationships, Faber paints a reality peopled with the unexpected, the unsavory, and the utterly flawed. Peter Leigh is a pastor recruited by the USIC, a government corporation that has recently taken over NASA as well as other large corporations and sectors, to act as a missionary on a newly colonized planet Oasis. Peter is forced to leave behind his wife, Bea, who the USIC will not allow to accompany him on the undertaking even though all of their missionary work has been done as a team in the past. In leaving Bea, Peter feels that he’s not only left the better part of himself behind, but that he is failing in his pastoral duties without Bea’s scrutiny and levelheadedness. Upon entering the Oasan atmosphere, Peter befriends the USIC staff as well as the native Oasan people the latter of who hunger for his knowledge of Christianity. Apart from Peter’s day-to-day action, we are also privy to a series of letters, epistles as Peter calls them, between himself and Bea. At first they are affectionate and filled with the mundane conversation of everyday life that the couple were used to having prior to their separation. As the gap of time between their last moments together widens though, the physical gap of the distance between them becomes more palpable, and the metaphysical connection that they once thought so strong is deeply shaken. Peter becomes more distanced and distracted by his mission as Bea becomes wrapped up in the world around her which she describes to Peter as being in a steep decline. Peter becomes a frustrating character that despite or perhaps in light of his understanding and calmness shifts into an almost vapid husband. Though he claims to love his wife, his letters to her lack the emotion he wishes to portray, and the words that come out on paper betray his idealistic notions of love amidst a world so far away from Bea’s problems. Similarly, it is hard for the reader to sympathize with Bea, since all we have of her in terms of contact are her letters to Peter. We know she is suffering, that things are going badly on Earth, and that she is not getting the emotional support that she needs from Peter, but we also see her lack of understanding for her husband’s issues on a planet that she can’t even conceive of. Both lovers are caught in their own worlds, unable to understand, sympathize or support one another in the way that they used to, and they are forced to question if their love can survive despite these obstacles. Throughout the arc of Peter and Bea’s relationship, we see the strains and constraints that love is capable of, and perhaps the limits of its power. Peter’s fidelity to his wife comes into question as he begins to fantasize about other women in a St. Augustine-esque fashion, feeling immediate guilt for what he sees as the inherently male reactions to a woman’s body and sexuality. 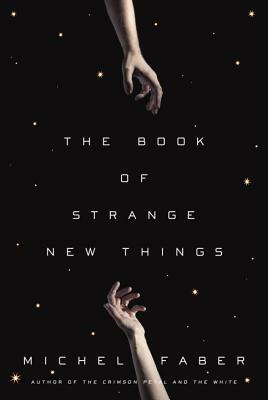 A book that explores all angles of humanity in a way that forces you to question your own ethics, morals and understanding of the natural ways of the world, Michel Faber’s The Book of Strange New Things is an adventure into the depths of the human soul. Released by Hogarth, you can find The Book of Strange New Things at your local bookstore.